Shaikh Rabee’ is an Imām of Ahlus-Sunnah with many volumes of writings and books that have been published. Before you is an amazing compilation and commentary by our Shaikh, the eminent Scholar, from the Imāms of Hadīth and Sunnah of the era, the carrier of the banner of Al-Jarh wat-Ta’dīl in this time, Rabī’ Ibn Hādī ʽUmayr Al-Madkhalī (may Allāh preserve him). 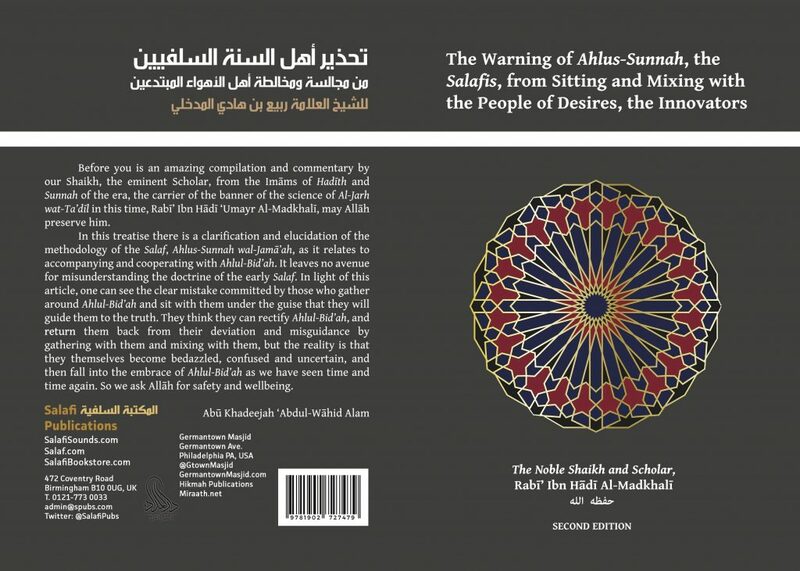 In this treatise is a clarification and elucidation of the methodology of the Salaf, Ahlus-Sunnah wal-Jamā’ah, as it relates to accompanying and cooperating with Ahlul-Bid‛ah leaving no avenue for misunderstanding the doctrine of the early Salaf. In light of this work, one can see the clear mistake committed by those who gather around Ahlul-Bidʽah and sit with them under the guise that they will guide them to the truth. They think they can rectify Ahlul-Bid‛ah, and return them back from their deviation and misguidance by gathering with them and mixing with them – but the reality is that they themselves become bedazzled, confused and uncertain, and then fall into the embrace of Ahlul-Bidʽah as we have seen time and time again. So we ask Allāh for safety and wellbeing. This treatise should be read and understood well by every caller to Salafiyyah in these times, so he is not deceived into thinking that by gathering together and mixing with the innovators and the people of Hizbiyyah that he is aiding the Salafī da’wah and strengthening it. Rather, he should know that he is harming the da’wah, falling into opposition of the Salafī manhaj, harming his own trustworthiness with Ahlus-Sunnah and endangering his religion by falling into the snares of the people of misguidance. All praise is due to Allāh, and may the peace and blessings of Allāh be upon the Messenger of Allāh, his Companions and those who follow his guidance. To proceed: Indeed the best of guidance is the guidance of Muhammad (صلى الله عليه وسلم), and worst of all affairs are the newly introduced matters into the Religion, for every newly introduced matter is an innovation and every innovation is misguidance. Then he said: “The intelligent one keeps company with good people and keeps away from evil companionship because having love for good people is quick in coming about and is slow in coming apart. And having love for evildoers is quick in coming apart and is slow in coming about. Companionship with evildoers brings about evil suspicions towards good people. Whoever associates with evildoers is not safe from entering into their ranks. So it is obligatory upon the intelligent person that he keeps away from the people of doubts so that he himself does not come under suspicion. For indeed just as companionship with good people leads to good, then likewise companionship with evil people leads to evil. He also said: “The intelligent one does not accompany the evildoers because associating with an evildoer is a portion of the fire that causes malice and hatred. The love of [an evildoer] will not last, and he will not fulfil his covenant. And the happiness of a person is found in four things: that his wife is agreeable, that his son is pious, that his brothers are righteous, and that his sustenance is in his land. حَدَّثَنَا أَبُو عَمْرٍو عُثْمَانُ بْنُ أَحْمَدَ بْنِ عَبْدِ اللَّهِ الدَّقَّاقُ قَالَ: حَدَّثَنَا جَعْفَرُ بْنُ مُحَمَّدٍ الْخَيَّاطُ , قَالَ: حَدَّثَنَا عَبْدُ الصَّمَدِ بْنُ يَزِيدَ الصَّائِغُ مَرْدَوَيْهِ قَالَ: سَمِعْتُ الْفُضَيْلَ ابْنَ عِيَاضٍ, يَقُولُ: الْأَرْوَاحُ جُنُودٌ مُجَنَّدَةٌ, فَمَا تَعَارَفَ مِنْهَا ائْتَلَفَ, وَمَا تَنَاكَرَ مِنْهَا اخْتَلَفَ, وَلَا يُمْكِنُ أَنْ يَكُونَ صَاحِبُ سُنَّةٍ يُمَالِي صَاحِبَ بِدْعَةٍ إِلَّا مِنَ النِّفَاقِ. [Ibn Battah with his chain of narration] to Mardawaih who said: I heard Fudail Ibn ‛Iyād (d. 187H) saying: “The souls are like gathered troops; those that were [created to be] acquainted with each other will come together [in this world]; those that were [created to be] averse to each other will differ and oppose one another [in this world]. So these are thirteen scholars from a gathering of one hundred and sixty five scholars of Sunnah. All of them warned from accompanying and mixing with Ahlul-Bid‛ah. All of these stem from the Prophetic texts that encompass warning from mixing with and showing affection to Ahlul-Bid‛ah and Ahlul-Ahwā’. And likewise this warning is built upon their experience and acquaintance with the effects of Ahlul-Bid‛ah upon the one who sits with them. أخْبَرَنَا عَلِيُّ بْنُ مُحَمَّدِ بْنِ أَحْمَدَ بْنِ بَكْرٍ , قَالَ: حَدَّثَنَا الْحَسَنُ بْنُ عُثْمَانَ , قَالَ: حَدَّثَنَا يَعْقُوبُ بْنُ سُفْيَانَ, قَالَ: حَدَّثَنَا عَمْرُو بْنُ عُثْمَانَ, قَالَ: حَدَّثَنَا بَقِيَّةُ, قَالَ: حَدَّثَنَا ثَابِتُ بْنُ الْعَجْلَانِ, قَالَ: «أَدْرَكْتُ أَنَسَ بْنَ مَالِكٍ , وَابْنَ الْمُسَيِّبِ , وَالْحَسَنَ الْبَصْرِيَّ, وَسَعِيدَ بْنَ جُبَيْرٍ, وَالشَّعْبِيَّ, وَإِبْرَاهِيمَ النَّخَعِيَّ, وَعَطَاءَ بْنَ أَبِي رَبَاحٍ, وَطَاوُسًا, وَمُجَاهِدًا, وَعَبْدَ اللَّهِ بْنَ أَبِي مُلَيْكَةَ, وَالزُّهْرِيَّ, وَمَكْحُولًا, وَالْقَاسِمَ أَبَا عَبْدِ الرَّحْمَنِ, وَعَطَاءً الْخُرَاسَانِيَّ, وَثَابِتًا الْبُنَانِيَّ, وَالْحَكَمَ بْنَ عُتْبَةَ, وَأَيُّوبَ السِّخْتِيَانِيَّ, وَحَمَّادًا, وَمُحَمَّدَ بْنَ سِيرِينَ, وَأَبَا عَامِرٍ» ,– وَكَانَ قَدْ أَدْرَكَ أَبَا بَكْرٍ الصِّدِّيقَ – ,وَيَزِيدَ الرَّقَاشِيَّ, وَسُلَيْمَانَ بْنَ مُوسَى, كُلُّهُمْ يَأْمُرُونَنِي فِي الْجَمَاعَةِ, وَيَنْهَوْنَنِي عَنْ أَصْحَابِ الْأَهْوَاءِ . So all of these twelve scholars and eighty-two other scholars: their statements were gathered by Imām Al-Lālikā’ī in clarification of the methodology of the Salaf and their stances towards Ahlul-Bidʽah and Ahlul-Ahwā’. Shaikhul-Islām Ibn Taymiyyah (d. 728H) said: “As for the Rāfidī, he does not accompany anyone except that he employs hypocrisy with him because the religion that is in his heart, is a corrupt religion that incites within him lying and treachery, and to trick the people and have evil intent towards them. He does not fail to do his best to corrupt them. He does not leave any evil deed that he is capable of doing except that he employs it against them. He is sickening, and is abhorred by even the one who does not know him, even if one does not know he is Rāfidī. Signs of hypocrisy are manifest in his face and the deceit in his speech. For this reason you see him behaving hypocritically with the weak minded people and with those whom he has no need of. [This is] due to what is in his heart of hypocrisy, which [in turn] weakens his heart. The believer has honour and strength of Īmān, for indeed honour is for Allāh, His Messenger and for the believers. Yet the Rāfidah claim to possess Īmān before the people, and there is within them lowliness and humiliation more than all of the other sects of the Muslims. They are furthest of the sects of Islam from receiving support, and the foremost in treachery. It is known that they are the closest of the sects of Islām to hypocrisy and the furthest from īmān. And a sign of this is that the hypocrites in truth, those who have no īmān with them, from amongst the atheists incline in favour of the Rāfidah, and the Rāfidah incline towards them more than the others sects do. Al-ʽAdhīm Abādī also said: “‘The souls’ meaning: the souls of humans, ‘are like troops’ in the plural, meaning: a gathering facing and opposing each other, or a mingled gathering. From it are those who are the party of Allāh and from it are those who are the party of Shaytān. ‘Those souls that were acquainted with each other before’: the acquaintance that is an outpouring of recognition between two people whose opposite is the rejection [of one another]. Meaning: those that had recognition of one another before their habitation of the bodies. ‘They came together’ Meaning: they attained between them affection and fondness once these souls entered their bodies in this world. ‘Those that repelled each other’ in the world of souls, ‘they oppose each other’ in the world of bodies. So we warn the Salafī youth from mixing with Ahlul-Ahwā’ and getting close to them, and being friendly with them, and putting trust in them. So learn from those who preceded us; from those who were deceived by their own souls where one of them would think that he could guide the people of misguidance, return them back from their deviation and misguidance, but he became bedazzled, confused and uncertain, and then fell into the embrace of Ahlul-Bid‛ah. There have preceded experiences from the dawn of Islamic history. There were those from the children of the Sahābah who trusted Ibn Saba’ (the founder of the Shī‛ah) and thus they fell into misguidance. There were those from the sons of the Sahābah and the Tābi‛īn who gave their support to Al-Mukhtār Ibn Abī ‛Ubayd, and fell into misguidance. Even in this era, there are people who give their support to many of the politicised misguided callers and the leaders of innovation and they fell into the snares of the people of misguidance. There are many, many people like this, but I will mention here the story of ‛Imrān Ibn Hittān. He used to be from Ahlus-Sunnah and he became enchanted with a woman from the Khawārij. So he became intent upon marrying her and then guiding her to the Sunnah, so he married her. Thereafter she caused him to fall into innovation. He wished to guide her, yet he went astray due to her. There are so many from those who ascribe to the Salafī manhaj and they say: “I will enter alongside Ahlul-Ahwā’ in order to guide them”, and then they falls into their traps. He continues until the end of these foul lines which he wrote in praise of this criminal, Ibn Miljim [the murderer of ‛Alī Ibn Abī Tālib]. May Allāh bless you. Then there is that with befell ‛Abdur-Razzāq as-San‛ānī (d. 211H) who was from the Imāms of Hadīth. He was deceived by the worship and abstemiousness (zuhd) of Ja‛far Ibn Sulaimān Ad-Duba‛ī. He become very close to him and so fell into the snares of Shī‛ism. Also Abu Dharr Al-Harawī, a narrator of the Sahīh. He was an eminent scholar of hadīth. He was deceived by a saying that was uttered by Ad-Dāraqutnī in praise of Al-Bāqilānī. He was carried by this saying in praise of Al-Bāqilānī until he fell into the snares of the Ashā‛irah and then became a caller from the callers of the Ash‛ariyyah. And due to him the Ash‛arī doctrines spread throughout the Arab Maghrib (North Africa, Morocco, etc.). The people of Morocco became close and friendly towards him, they would come to him and visit him. He propagated the Ash‛arī doctrine amongst them. They accepted him and at that time, they did not know except the Salafī Manhaj. He established for them this evil path. We ask Allāh for wellbeing. Al-Bayhaqī was deceived by the People of Misguidance such as Ibn Fawrak and those similar to him. He used to be from the eminent scholars of hadīth and then he fell into Ash‛ariyyah. It is possible that there comes forth an ignoramus who trusts himself and is deluded by that. He has no knowledge to protect himself with. So this one is a hundred times more likely to fall into bid‛ah than those scholars we have mentioned. So you see this circulating now in the arena and domain of Salafiyyah. It is as Allāh has willed: you do not sense it until the miskīn [who has no knowledge] turns and fights against Ahlus-Sunnah such that, what used to be evil to him becomes good and what used to be good to him becomes evil. So this is indeed utter misguidance. So we warn the Salafī youth from being deceived by Ahlul-Bid‛ah or trusting them. What is with the Book? Where can I buy it.